It really was the question, at least when the unorthodox British performance troupe Forced Entertainment conceived of its latest project, “Table Top Shakespeare,” which runs Tuesday through Saturday at the Center for the Art of Performance at UCLA. 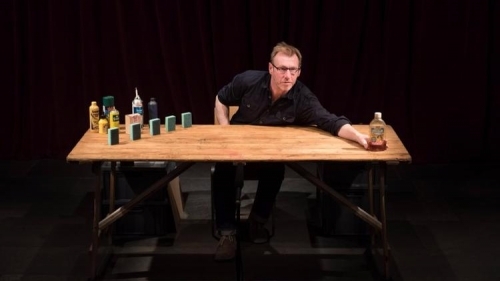 This experiment in radical reinterpretation features a lone actor on stage sitting at a simple table using a variety of everyday objects to tell one of Shakespeare’s plays in an hour or less. Over six days, six actors will perform the works of the Bard, 36 plays in all. There is a kind of comedy in it, but incredibly something quite beautiful happens when these things meet,” he says by telephone an hour before he is due onstage in Brussels for a different show. Although humor is innate to the basic premise of these shows, the idea is not to play them for laughs. Pathos emerges just as easily. This is the second year Forced Entertainment has performed “Table Top Shakespeare.” Last year in Berlin, the response was so positive that the troupe took the show to Switzerland, Italy and Poland, among other places. The group’s appearance at CAP UCLA marks “Table Top Shakespeare’s” West Coast premiere. Distilling famously complex plays with myriad plot lines and opaque language into simple, even straightforward tales was no easy task for Forced Entertainment’s six members. Etchells opted out of performing in the project because he says he was “a bit frightened” of all the work of figuring out the plots. Besides, the pieces needed an objective director. Actors studied the characters, sussed out the major themes and boiled down the plays to succinct narratives using easily accessible language. Once that was done, they came together and swapped ideas. By virtue of his relative distance to this process, Etchells served as the lead observer, letting performers know when certain objects or spatial arrangements on the table weren’t effective. While keeping their solo performances in “Table Top Shakespeare” in their brains, two members of the group were performing “The Notebook” (based on the 1986 novel by Ágota Kristóf, not the Nicholas Sparks book) at Théâtre de la Bastille in Paris before flying to L.A. and switching caps straight away. It reminded Etchells of when his kids were little and he would entertain them with the salt and pepper shakers while they were eating their breakfast. Just like with the objects on his breakfast table, the casting in “Table Top Shakespeare” can feel a bit random. There’s an element of making do with what you have, Etchells says. At other times certain choices can feel quite significant and audience members can read a great deal into them. Macbeth, for example, is played by an extremely worn jam jar that has been used to store paintbrushes and is thus stained with paint, and it still has a few brushes inside of it. Could the paint stains be King Duncan’s blood? Banquo’s ghost is a cheese grater. Yes, his infernal spectral apparition does chafe Macbeth’s soul. When the violence of Shakespeare’s tragedies is transposed onto these mute objects, it can be strangely affecting, Etchells says. In the case of the comedies, many of which involve mirroring and twins, it’s pleasing to show the themes in a schematic way on the table top. That is ultimately the point. If you’re an English theater troupe, there is the inevitable expectation that you will eventually tackle the classics, Etchells says. Forced Entertainment resisted this assumption until it struck on a novel way to do it — one that the group felt added something fresh and new.